Sister Act is back, and it's sparklier than ever! 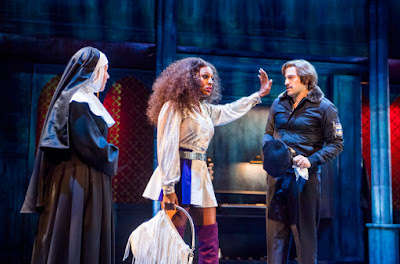 Directed by Craig Revel Horwood, this new actor-musician production of the Broadway and West End sensation stars X Factor winner Alexandra Burke as Deloris Van Cartier, a nightclub singer who is forced to hide away in a convent when she witnesses her gangster lover commit a murder right in front of her. The musical is a fun, glittery and uplifting show about the power of friendship and the magic of music. Alexandra Burke is a likable leading lady who nails the show's comedic elements and sings the role gorgeously. Of course given her previous singing credits the latter is no surprise, however, in a time when star casting is being increasingly scrutinised by casual theatregoers and passionate theatre lovers alike, it is exciting and refreshing to see such a fabulous all round performance from Ms Burke (who made her professional theatre debut playing the lead role of Rachel Marron in The Body Guard on the West End in 2014, before joining the UK Tour). She is joined onstage by a brilliant cast of performers. As Deloris' love interest Lt. Eddie Souther Jon Robyns is charmingly goofy and instantly likable, and milks every moment of his showstopping solo I Could Be That Guy, during which he is joined by a chorus of down-and-outs in a gloriously 70s dance number, complete with customary flairs! Meanwhile Aaron Lee Lambert plays Deloris' lover Curtis with piles of over the top villainy, making him an entertaining if not always imposing antagonist. He also has an excellent voice, as heard in When I Find My Baby (a sinister yet catchy number). Curtis' three henchmen (played by Ricky Rojas, Samuel Morgan-Grahame and Sandy Grigelis) steal the show at times, especially Grigelis whose delightfully gormless TJ is particularly entertaining. Their act 2 song Lady In The Long Black Dress walks the line between funny and uncomfortable, but fortunately stays on the lighthearted side thanks to some joyously over the top choreography, with is performed with panache. In fact, Sister Act is full of brilliant musical numbers, and with music and lyrics by Alan Menken and Glen Slater that is hardly surprising. The highlight of the show is most definitely Raise Your Voice, during which Deloris finally teaches the nuns how to sing. The song is wonderfully uplifting and a real earworm, and it perfectly encapsulates the spirit of the whole show. Meanwhile Alexandra Burke gets to show off her voice in songs such as the sizzling diva number Fabulous Baby and the more understated title song Sister Act. However, while Sister Act is jam packed with exciting performances and catchy tunes, the book itself feels a little disjointed at times. For a story about a woman whose life is in danger, there is very little sense of threat for much of the musical. In fact despite the fact that act 2 is relatively fast paced and plot heavy, several of the dialogue scenes feel slightly aimless and repetitive. Equally, many of the characters interpersonal relationships seem a little rushed or unfounded. In short, the plot feels a little thin at points, while several characters never seem to be explored much at all, and to some extent this is emphasised by some unusual directorial choices. On a positive note, the production in itself is a very visually exciting one, with Richard G Jones' lighting design being particularly distinguishable. Sister Act's large group numbers are elevated by a barrage of colour which really emphasises the disco atmosphere of some songs, and of course, a healthy bit of disco ball usage is very much appreciated by the audience (and characters!) at times. This new production of Sister Act is certainly an entertaining one, and while the book is arguably flawed in some ways, all in all the show is a feel-good fun time brimming with fabulous performances and show stopping songs which will have audiences dancing in their seats. Sister Act is touring the UK now, visit the official Sister Act UK Tour website for more information and to purchase tickets.